Michael Mina can be found in the store-front of an historic bank-like building in the heart of San Francisco’s Financial District. You may remember the location from its days as Aqua. It has since been beautifully re-visioned – The large windows, textured décor, and diffused light make for intricate shadows throughout this spacious restaurant. 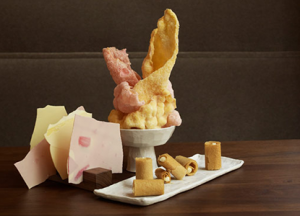 Michael Min, a Michelin-starred destination since opening in October of 2010, is must-visit for any food lover. You will soon see why it’s so lauded. 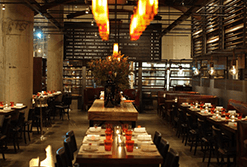 It is a lively, often noisy downtown San Francisco destination, and features a New American menu, as well as perennial fan-favorites. Japanese ingredients with a French twist. With each visit, Michael Mina delivers a culinary adventure, wonderful service, and earns top marks for its stylish décor; upscale, formal elegance. The wine list is fantastic and guaranteed to impress. Sure, it’s a spendy spot; however, it is well worth dropping the ducats. The “ever-buzzing scene” reminds you of all that’s good about city-living in San Francisco! The Michael Mina food philosophy quite simple: “Food that is bold, balanced and that keeps you interested time after time”. Rather than cooking, for Michael Mina it all starts with learning how to taste food. It’s about finding the right balance of acidity, sweetness, spice, and fat (richness). These are the four key ingredients required for balance in the dish. 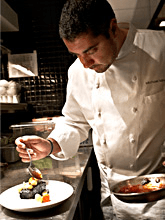 Renowned for his innovative twists on classic dishes and his focus on balance of flavors, Michael Mina is an award-winning chef and restaurateur. Born in Cairo, Egypt and raised in Washington State, Michael’s love affair with the kitchen started at an early age. He is committed to his passion for creating memorable dining experiences and welcoming guests into his home. He received his formal training at the Culinary Institute of America in Hyde Park, NY. The perfect choice for a fancy date, Michael Mina understands the art of the cocktail – Perfectly balanced and delightfully refreshing. Move on to the world’s most perfect grilled cheese sandwich and shooter of soup. Enjoy the Brandt Farms beef ribeye, “Five Seas” fasting of Japanese fish. lobster pot pie. Throughout the meal both the food and service always exceed expectation. Portions are generous and the Michael Mina desserts, with tastings that include as many as six items, are as beautiful as they are inventive. Certain to tickle your fancy. If you find that you would like to share the Michael Mina experience at an event, thankfully, they offer catering services as well! Photo Credit: A special thank you to Micheal Mina for use their photos. What a treat indeed!